There is a current CDC investigation into the use the preservative free agent Methylprednisolone in Epidural Steroid Injections. We do NOT use the preservative free agent Methylprednisolone. And we do NOT order medications from the compounding pharmacy in Massachusetts currently linked to this outbreak. For questions concerning your individual care, please contact our office at (810) 985-4900. Runners charge down the drive from Orthopedic Associates shortly after the the start, Saturday August 18, 2012, of Orthopedic Associates 5k, 10k Fun Run in Port Huron. The annual Orthopedic Associates’ community event is scheduled for August 18 PORT HURON, Mich. (August 2012) – Individuals of all levels of fitness, from marathoners to casual runners, are encouraged to attend Orthopedic Associates of Port Huron’s 5th Annual Fun Run on Saturday, Aug. 18. The 10K, 5K (walk and run) and 1-mile run events will start at the practice at 940 River Centre Drive. Samantha Zakalowski had grand plans for the summer. Courtney Corby has learned a lot about her knee in the last year. After tearing her ACL in a basketball game as a junior and rehabbing her way back to health for her senior athletic season, Corby wrote a research paper on the subject, finding out that as a girl she’s more susceptible to a severe knee injury than her male counterparts. 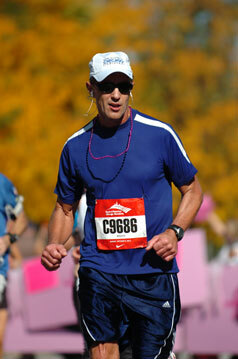 While running his third marathon, Dr. Steve Heithoff qualified for a fourth. The 56-year-old Port Huron resident met the qualifying time for the Boston Marathon while running in the Chicago Marathon on Oct. 9. Heithoff's time of 3 hours, 44 minutes and 45 seconds was 15 seconds faster than the qualifying time for his age group.